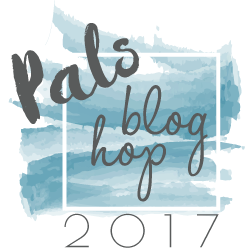 Welcome to the Pals Blog Hop for January 2017. We are thankful you stopped by to take a look at our 2017 Blog Hop monthly themes. This month our projects showcase themes that are “from the heart.” This includes any of the following themes… Valentine’s Day, Thinking of You, Get Well and/or Sympathy. We hope to provide you with lots of ideas and that you enjoy our creations. My cards are a "family" of sympathy cards. You see, a patriarch I know passed away last week and I know his widow and his three grown children, therefore I wanted to give four separate cards to show my love and send comfort. After making the first card using a 4" x 5-1/4" print from Falling in Love Designer Series paper, I decided to use the rest of the 4" strip I cut for two more cards. My 4th card is just the Crumb Cake card stock base with the same rows of Gold Embossed Delicate Details images. I used all of the images from the stamp set and just placed them on my clear block, making sure they were straight. I used my Stampin' Grid paper to see through the block while placing the images. You see here my "family" of cards (minus the one without designer series paper). I hope you enjoyed looking. Please leave me a comment so I know you were here! Use my Online Store to order your Stampin' Up! products any time. Patti, I would not have thought to use the Delicate Details stamp set in this manner... what a lovely set of sympathy cards!! Thanks for sharing!! Patti, sympathy cards are the hardest ones to make. Your family of cards have such a nice tranquility to them, simply beautiful! Patti... these cards have forced me to take another look at that stamp set. It really does look like you've cut and layered everything. Beautiful! These are stunning and I am sure will be well received at a difficult time. Beautiful and very thoughtful sympathy cards, Patti. I especially love your gold embossing on crumb cake card! Well..you did it! I am going to pull this out and use it! I have it has not had a date with an ink pad yet! They are just beautiful and I can easily see many ways of using these border stamps! Super post!